To commemorate my 25th year of being a vegan, I have decided to share some stories from various investigations I have done of factory farms, auctions and slaughterhouses. Though these investigations were conducted with the organization I started and ran, Viva!USA, they are a powerful part of my life and hopefully will help many understand why veganism is a key part to Food Empowerment Project’s goal of a more just food system. The first animal rights video I ever saw was The Animals Film in 1987. That was the first time I saw the “debeaking process” of chicks – it has been seared into my mind ever since. In case you are not familiar with the film, it actually goes through the many different ways in which animals are killed, exploited and abused. I was in high school at the time, but I remember thinking, “I could never take footage like that.” But as all activists know, many times we do things that we never thought we could. Somehow, we find the strength through our convictions to do what we never thought possible. My first investigations brought me to look for farms in California, where baby male calves are raised for the “veal” industry. And I found one. When I first walked through the door, I saw dozens of stalls (maybe 50). If you have ever seen footage of calves raised for the “veal” industry, you know what the stalls look like: dark, small and with chains nearby. But these stalls were empty. Half relief and half disappointment came over me. I was glad there were no animals there, but I was also disappointed, as we were trying to prove the industry was still alive in California. As I was leaving, I walked by half a dozen stalls. 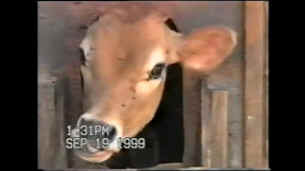 Housed in some were the most adorable jersey cows – the cows with those big, beautiful brown eyes and long eyelashes. They were covered in flies. Now these stalls were outside and bigger than the ones I had seen in the shed – but don’t get me wrong, they were small. I imagine it was this farmer’s idea of a more “humane” method. These sheds were still so small that the calves could not take free steps and there were no food or water troughs for them, either. But this is where some of the real pain of doing these investigations happens. After taking the video footage I left – physically; however, my mind stayed with those calves, looking into their eyes – wondering how I could have left them. My mind went over having to accept that I was indeed a speciesist. I knew that if those had been human animals, I would not have left their side. I would have called the police and stayed with them until justice had been served. However, I left. I left those babies, with the only satisfaction that I could get, which is that I could share their story with others. I could help people to understand that dairy consumption is the reason calves like these are confined in tiny stalls. Not too far from where I videotaped these calves is an auction house. The auction house is open one day a week, and it auctions off a variety of animals. The place is filthy, smells awful and, well, has a restaurant on site. Yes, a restaurant. Ugh…I guess it shows you the mentality of these folks. This is where I realized another intense difficultly for me doing these types of investigations. It is horrible videotaping animals suffering and in typical farming conditions; however, once humans begin abusing the animals, I have a hard time not intervening. During the auctions they would prod the animals in and out of the ring and to turn around. The calves would sell for mere dollars. I will never forget the most beautiful Black Angus calf who, while entering the auction house, slipped. My heart wrenches remembering it now. This magnificent creature full of strength and grace (under normal circumstances) left at the mercy of a merciless system. But luckily we know we don’t have to be a part of this system.